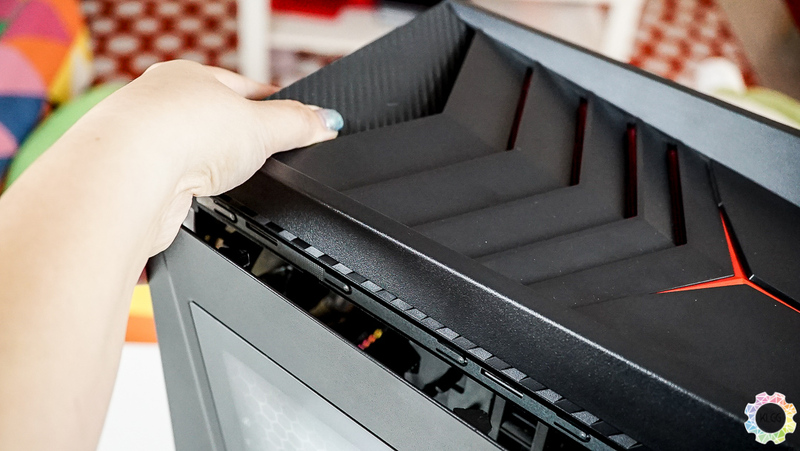 While building a desktop is no longer the herculean task it once was, it can still be one of the more intimidating things that a person who wishes to enter the realm of PC gaming can do. That is why huge computer manufacturers still construct desktop machines for those who wish to skip the assembly process and proceed straight to the games. 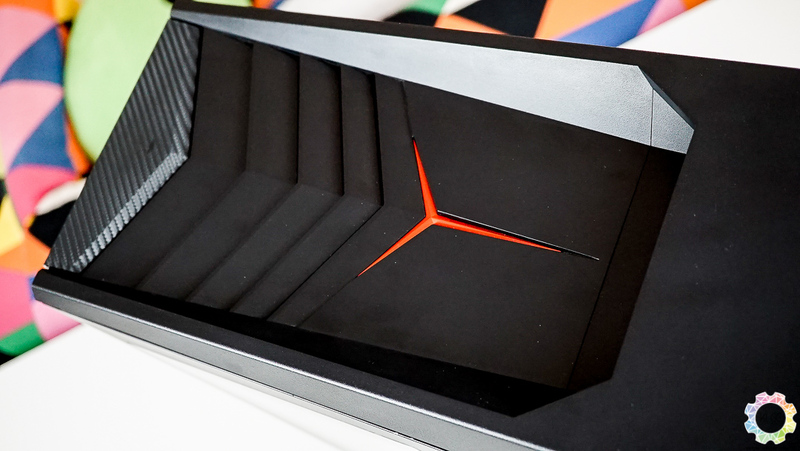 The Lenovo IdeaCentre Y900 is one such desktop, being a desktop with souped-up innards that is gaming-ready right out of the box. However, is the Y900 worth your time? Let’s take a look. 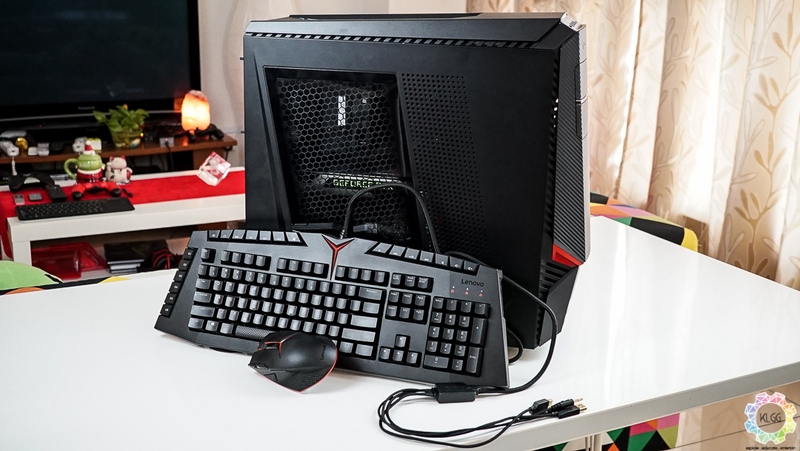 In terms of looks, the IdeaCentre Y900 pretty much fulfills the stereotype of a gaming PC. 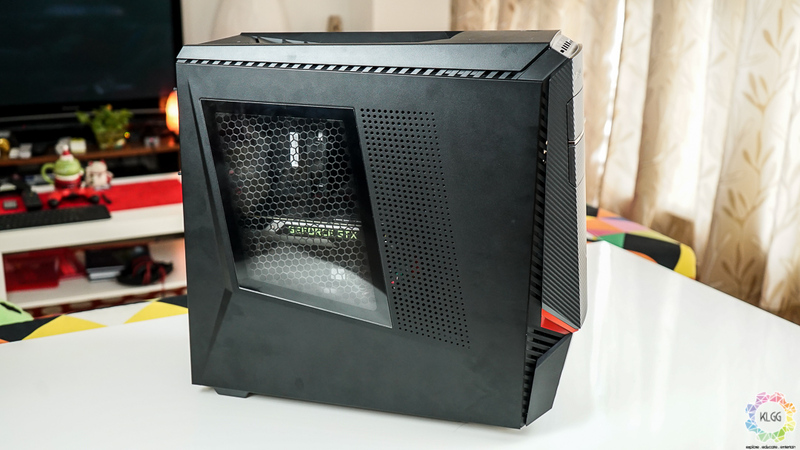 It is coloured black all over with red accents and LED lights, it has sharp angles to make the system look aggressive, it even has a windowed side panel for those who like to show off the interior of their PCs. Located at the upper-front section of the desktop are four USB ports, an audio jack, a microphone jack, and an SD card reader. The positioning of the ports means that it would be wise for you to place the system on the ground while your monitors and peripherals are located on the table, allowing for easy access to the ports. You’ll also find an optical drive located at the front of the desktop. At the top, you’ll notice that there are slopes on the casing. This is where the machine’s vents are place, allowing hot air to travel out of the casing. The slope panel will also allow you to open the side of the casing, but we’ll get that a bit later. 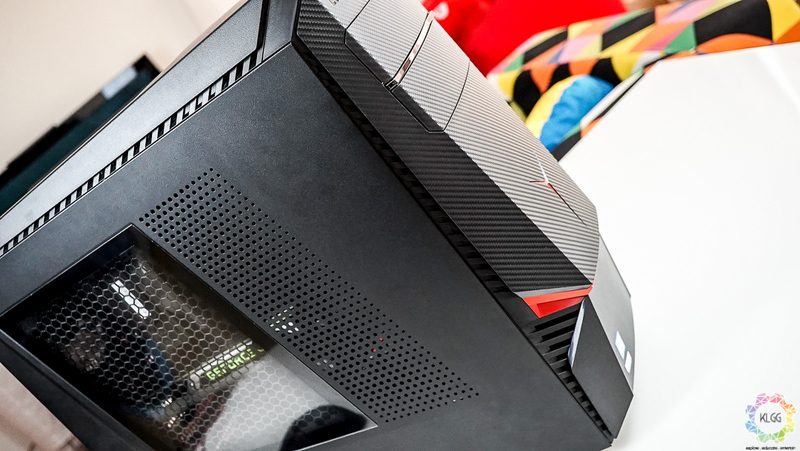 Components make or break a gaming desktop and for the most part, the Y900 is pretty impressive. Much like other gaming PCs build by manufacturers, the Y900 can be customized according to your budgets and needs. 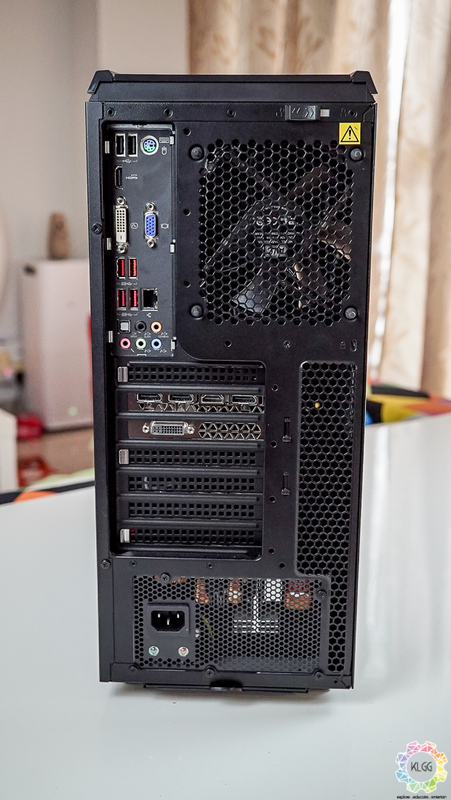 For this review unit, the machine sports an Intel Core i7-6700K, 16GB of DDR4 RAM, and a 2TB hard drive. The graphics card is where things get a little more disappointing, as the Y900 still relies on Nvidia’s Maxwell cards. 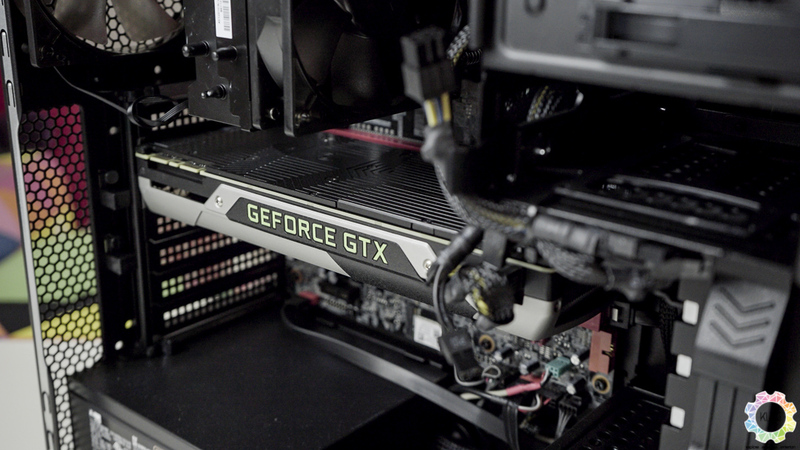 The machine we’ve gotten runs on an Nvidia GTX 970, but you can opt for a GTX 980 if you have the budget to do so. Don’t get me wrong, the GTX 970 is still a very powerful card in its own right, but seeing as the Pascal cards has been out for a while now, I can’t help but feel that the Y900 is a machine that is already behind in times. Let’s get straight to the point. The Y900 is a very powerful machine. The components that the Y900 has means that you’ll be able to game at high to maxed out details at 1080p resolution. If you have the necessary hardware for it, the Y900 can also handle VR content with little issues. As for daily tasks, the Y900 can handle pretty much anything you throw at it. Standard office work? No problem. 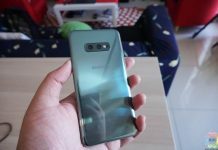 Video editing? It’ll be done before you know it. Graphics rendering? It’ll take a while, but it can handle that as well. For the operating system, the Y900 runs Windows 10 Home right out of the box. 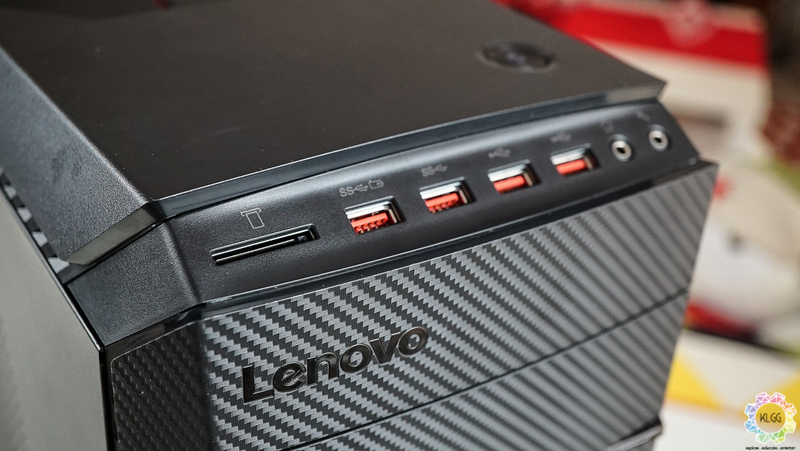 As this is a Lenovo machine, the Windows 10 Home experience isn’t exactly vanilla. Lenovo has installed some of its software into the Y900, but thankfully, it is nowhere near as intrusive as those that can be found on Lenovo’s laptops. While most of Lenovo’s custom software is ignorable, one of them is important, as it will allow you to overclock the machine’s hardware (both CPU and graphics card) and lighting. The biggest advantage that a desktop machine has over a gaming laptop is in its upgradability, and the IdeaCentre Y900 agrees with that statement. 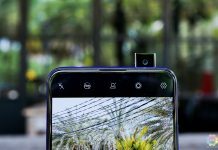 Lenovo has designed the desktop in such a way, you’ll be able to upgrade all the components without requiring any tools. Opening the case itself is simple. Just flip the little knob located at the rear of the case to the “unlock” position, push down on the top panel of the case, and the side casing will instantly pop up, granting you access to the inner parts of the machine. As mentioned earlier, the Y900 is designed with tool-less upgrade in mind. This means that upgrading various components in the PC is all a matter of slotting in components into their right positions and making sure its secure. 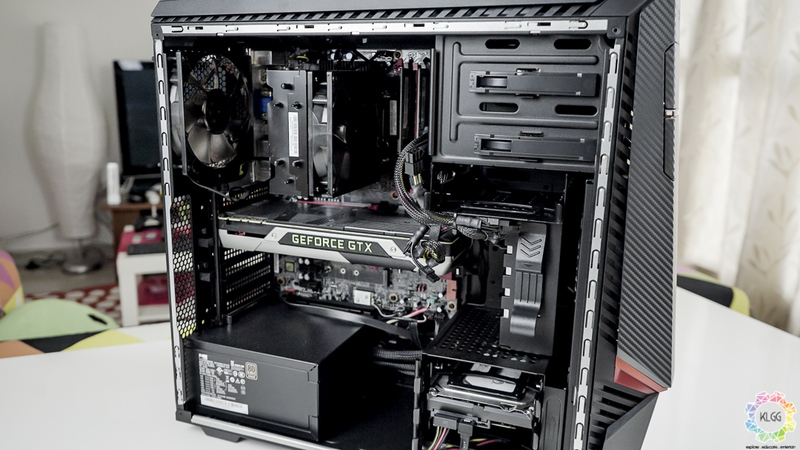 Every part of the Y900 is upgradable, from the graphics card, to the hard drives. Heck, you can even upgrade the power supply unit if you want to. As the case itself leans on the huge side, long graphics cards can be fitted into the machine without breaking a sweat. The only drawback in terms of upgradability that the Y900 has is that it doesn’t support liquid cooling. Then again, if you’re the type who is capable of installing a liquid cooling system, you would have opted to build a PC of your own in the first place. Besides the desktop machine itself, Lenovo will also throw in a gaming keyboard and a gaming mouse as part of the package. 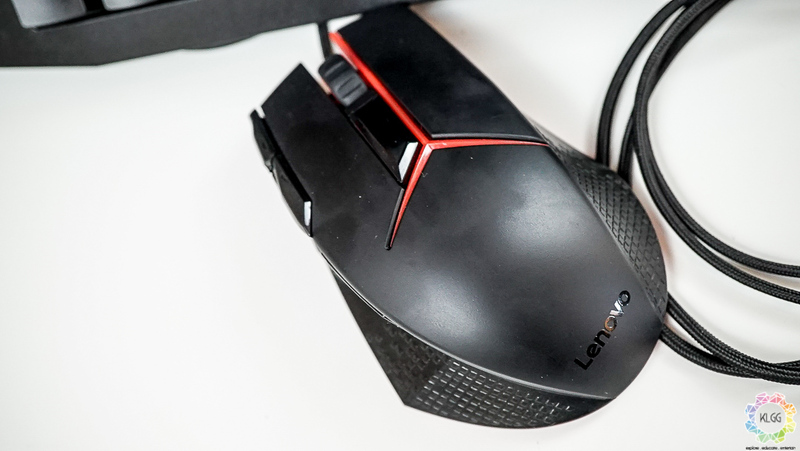 The mouse itself is a pretty straightforward gaming mouse, as it is highly sensitive, comes with numerous buttons, and sports features like on-the-fly DPI switch, as well as a weights you can add or remove from the mouse to make it heavier or lighter. 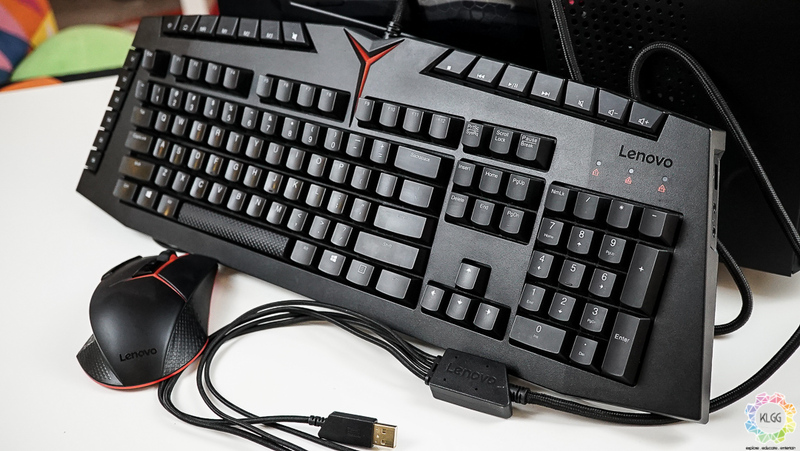 As for the gaming keyboard, Lenovo’s offering is a proper mechanical keyboard, and it is certainly one of the most intimidating keyboards that I’ve ever seen. Besides the standard keyboard layout, the keyboard sports two seperate set of macro keys, as well as a set of media keys located along the top and the left side of the keyboard. The keyboard uses Kailh’s red switches, a switch that requires little force to activate and is relatively quiet. If you’re lacking in proper gaming peripherals, both the mouse and the keyboard are perfectly satisfactory to use. 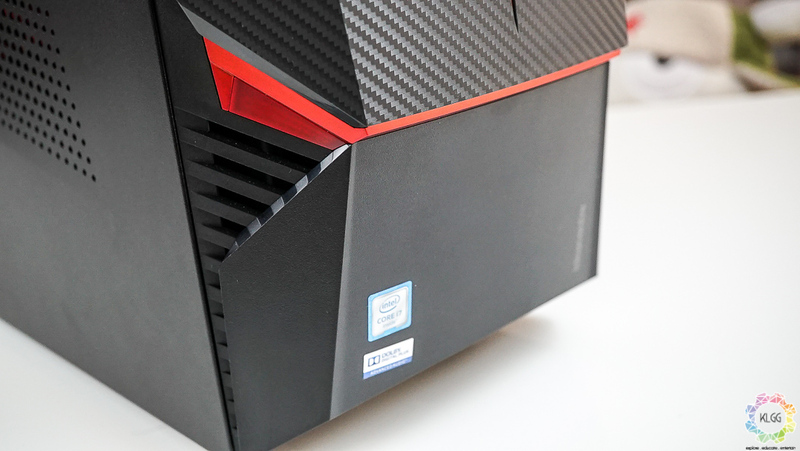 Lenovo's IdeaCentre Y900 gaming desktop is very much a machine made for the long haul. The simple fact that it is upgradable means that the Y900 will be able to remain relevant as time goes on. With a starting price of RM6,499, the Y900 isn't what I would call expensive, but it isn't exactly affordable either. Make no mistake, you're very much paying a premium for the convenience when it comes to the Y900. It is highly likely that a custom built PC with similar specifications will be much cheaper than the Y900. That being said, the Y900 is a worthy consideration if you're looking for a desktop that'll last you for years to come.